What Makes Ottery St Mary Special? What Can We Do in Ottery St Mary? Visit St Mary's Church, home to one of the oldest surviving mechanical clocks in England. Enjoy the annual Tar Barrels celebration. Wander through the gardens at Cadhay House. Walk along the River Otter from Ottery St Mary to the Jurassic Coast. 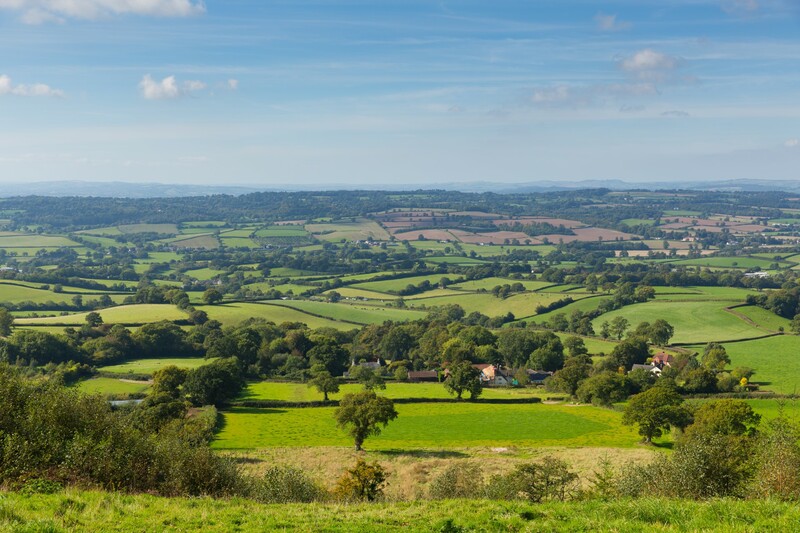 Explore the East Devon Area of Outstanding Natural Beauty. Take a picturesque train journey to Exeter. See the Tumbling Weir, dating back to medieval times. Go fossil hunting in nearby Lyme Regis. Enjoy a pint of local ale at one of the town's welcoming pubs. Look out for otters in the River Otter. Where Can We Stay in Ottery St Mary? Book a room at one of the town’s inns, such as The London Inn. Stay at one of the area’s country hotels or estates. Pitch a tent at a campsite in the countryside surrounding the town. Ottery St Mary – or simply 'Ottery', as it's known to locals – is a town in East Devon. Set on the River Otter, around 10 miles east of the city of Exeter, it is a small, traditional Westcountry community. The town is perhaps best known for its connections to romantic poet Samuel Taylor Coleridge, who was born there. His father, the Reverend John Coleridge, was a local vicar. Ottery St Mary has several independent shops, mainly in and around Mill Street, Yonder Street and Silver Street. In the heart of the town is the Square, around which pubs, restaurants and tearooms are scattered. One of the town's most iconic features is its grand church, St Mary's. Renowned for its intricate designs, it houses the Ottery St Mary Astronomical Clock, one of the oldest surviving mechanical clocks in the country. There is also a small stone plaque, commemorating the poet Samuel Taylor Coleridge. Ottery St Mary's location in East Devon makes it the perfect base for countryside and coastal walks. Visitors can wander alongside the River Otter from the town all the way to the Jurassic Coast at Budleigh Salterton, 13 miles away. The cathedral city of Exeter is just 17 miles away, with stunning architecture and many of the region’s best restaurants. There are several pubs, including The Kings Arms, The Lamb and Flag Inn and the Rusty Pig. Nearby attractions include Wildwood Escot, 220 acres of parkland home to many threatened native species such as the red squirrel and elusive water vole, as well as wolves, lynx, otters and birds of prey. Peak Hill Llamas in Sidmouth offers guided walks with llamas on the Jurassic Coast. Lyme Regis is one of the best places to find fossils, as part of a guided tour or independently. For visitors exploring Ottery St Mary on November 5th, the iconic Tar Barrels event is not to be missed. In a tradition dating from the 17th century, locals soak wooden barrels in tar and set them alight before carrying them through the streets. The barrels are lit outside each of the pubs and can weigh up to 30kg. Only those who were born in the town, or have lived there for much of their lives, are permitted to carry a barrel. Ottery St Mary is first mentioned in the Domesday Book of 1086, where it is listed as 'Otri' and 'Otrei'. The full name of 'Oteri Sancte Marie' is first mentioned in 1242. The town takes its name both from the River Otter on which it stands, while 'St Mary' is a reference to the fact that it once belonged to the church of St Mary in Rouen, in 1086. The parish church of St Mary has often been referred to as a miniature Exeter Cathedral, thanks to its impressive architecture. It is said that Sir Nikolaus Bernhard Leon Pevsner, a British scholar of the history of art and architecture, described St Mary's church as 'lying large and low like a tired beast'. It was consecrated in 1260, when the manor and patronage of the church belonged to Rouen Cathedral. Over the years, the church has undergone many alterations, including a restoration by architect William Butterfield, a Gothic Revival architect. For one day in June every year, the people of Ottery St Mary celebrate Pixie Day, commemorating an ancient legend of pixies being banished from the town to local caves, known as 'Pixie's Parlour'. According to the legend, a local bishop decided to build a church in Ottery St Mary and commissioned a set of bells to be delivered by monks from Wales. Upon hearing this news, pixies became concerned that it would spell the end of their rule, so they cast a spell over the monks. The spell caused the monks to change direction, leading them to the perilous cliffs of Sidmouth rather than Ottery St Mary. Just as the monks were about to walk over the cliff edge, one is said to have stubbed his toe, exclaiming 'God bless my soul', and the spell was broken. Legend has it that the bells were installed within the church, however for one day each year in June, the pixies return and capture the town's bell ringers, imprisoning them in Pixie's Parlour. How do you get to Ottery St Mary? Ottery St Mary is an eight-minute drive from Feniton Railway Station, which connects to services to Exeter St David’s and London Waterloo. From Monday to Friday, around 13 trains run each day between Feniton and Exeter St David’s, taking approximately 20 minutes. Exeter also has an airport which offers routes to cities across the UK. Driving to Ottery St Mary from the west, take the A303, merge onto the A30 and take the exit for Ottery St Mary. The town is approximately a three and half-hour drive from London and one hour 45 minutes from Bristol.